The Pakistan Red Crescent Society was established on 20th December 1947 By Quaid-e-Azam Mohammed Ali Jinnah by an order called “Pakistan Red Cross Order” under the Act. of 1920. This Organization was successfully run till February 1974 as “Pakistan Red Cross Society”. The Act of 1920 was amended by the Parliament of Pakistan in February 1974 converting the Red Cross into Red Crescent. The Society is a STATUTORY BODY and not an NGO as perceived by the general public. It has its own National and Provincial constitutions. The original Sindh branch came into being in 1936-37 on the separation of Sindh region from the Bombay presidency. Later on the formation of the one unit of West Pakistan, Sindh branch was also merged with the West Pakistan “Red Cross’ Society (HQ Lahore).The Sindh Provincial branch was re-established in 1972 after the dismemberment of West Pakistan. In accordance with the mandate given in the PRCS act of 1974, new Sindh Provincial branch framed as its own constitution which is in force since 1977. 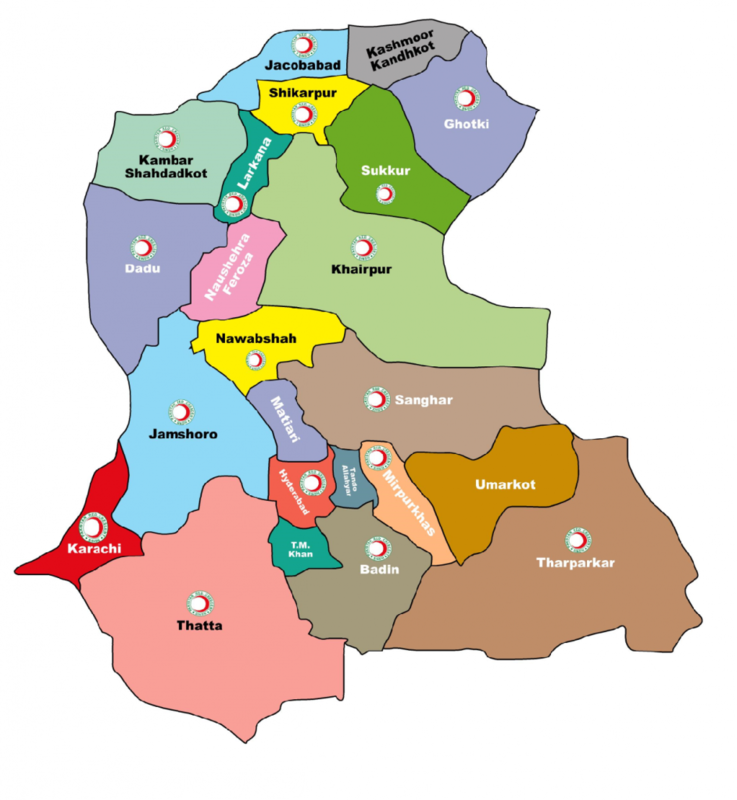 The Sindh provincial branch of society has autonomous district branches functioning in the province. It is headed by the Governor Sindh, as its president. It has well constituted managing committee headed by the chairman and nominated/elected members. This branch has a long and distinguished record in humanitarian work in the entire province especially in times of disaster & perilous situation. So far 16 district branches have been established in Sindh we are geared for rendering essential services in times of grave calamities and carries out its work through a team of dedicated staff and volunteers. Its exclusive humanitarian mission is to assist the most vulnerable people and protect the dignity of the suffering humanity during war, conflict, natural and man made disasters. In peacetime it also carries-out Disaster Management (Preparedness, Response/ Relief & Risk Reduction), Health Care, Youth Activities, Emergency Volunteers Corps, Trainings at national and international levels. Moreover, the Movement spreads awareness about International Humanitarian law, Humanitarian Diplomacy and endeavours to promote humanitarian values for Global Peace. It has total 190 countries as members of the Red Cross / Red Crescent Movement in the world. The Red Cross has a permanent status in the United Nations as an observer. Tracing of Missing Persons & Restoration of Family Links. The Pakistan being one of the most disaster prone countries in the world is highly venerable especially in Asia. As per Act of Parliament and the Constitution of the Society, the basic mandate of this organization is Disaster Response and Relief. 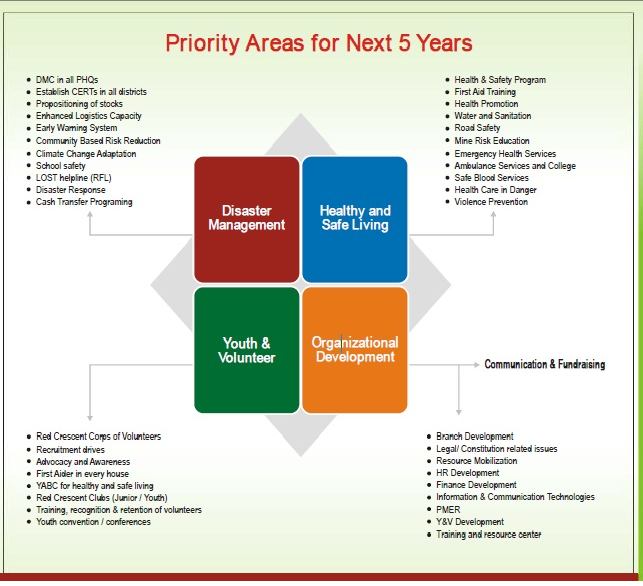 The field of disaster management in Pakistan is going through a phase of transformation. Increasing frequency of disasters in the country and especially the changed security environment in the region has exacerbated the level of man-made disasters and has raised new challenges to the Humanitarian Organizations in general. Realizing the importance of man-made disasters especially act of terrorism has compelled us to develop a special cooping mechanism i.e. “Urban Disaster Response System”. For this, we are in a process to establish an state of ART Emergency Operation Center (EOC) at our Provincial Headquarters building Clifton Karachi. A newly constructed floor will be completed in coming April and the inauguration of the same will be held in May some time. This EOC will have a components of Climate Change, research and development, advance training in DM and a separate coordination system. This will also be connected with almost all emergency related department like PDMA, MET Department, City Government, Traffic Police, CPLC, Institute of Oceanology etc for better coordination and prompt response. 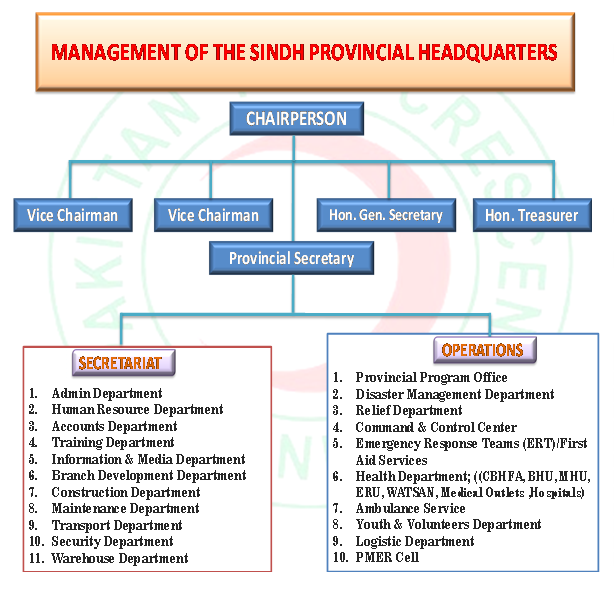 This Emergency Operation Centre will be based on ERTs of PRCS which are already established in Karachi and many disaster prone districts of Sindh. These teams all trained in First Aid, Casualty Handing, Basic Rescue, Basic Fire Fighting and Emergency Evacuation. These teams have been rendering remarkable services in the last 5 years in Karachi and in Sindh as well. The Pakistan Red Crescent Society , perhaps is the only orgtinzation which conducts regular courses on disaster management in various subjects. We regularly hold national and provincial workshops on different subjects of disaster management like contingency planning, pre and post disaster assessment, logistics and warehousing, relief and rehabilitation, reporting and communication, emergency health response, Psychological support, mass casualty and dead body management etc. Every year PRC prepare a consolidated document on contingency planning after having series of meetings with all provincial branches and international partners. The International Federation of Red Cross & Red Crescent Societies has a following response mechanism at international, regional and local levels. RDRT (Region Based team, comprising of technical experts from the same regional countries). NDRT (Country based team comprising of national experts in the country. The Sindh Provincial Branch has a fleet of 35 ambulances in all over Sindh. These includes 4×4 ambulance Pajeros for non-metal road and desert areas of Sindh. These were especially purchased from Japan with the conversion of Ambulance facility in the vehicle. In order to meet the disaster situation promptly, we have placed these vehicles on strategic locations like Hyderabad, Mirpurkhas, Sukkur, Khairpur beside Karachi. The Sindh Provincial Branch is the pioneer Branch in training. The training center started in 1985 and converted into full fledged training institute of the Society. today it has more than 16 staff members who are well qualified trainers in First Aid and emergency response subjects. So far we have been able to train more than 100,000 people in overall Sindh. This training Institute is also extending its facility to outdoor courses to Government offices, police departments, traffic police, highway police, multinational companies , factories and commercial undertakings etc. This institute is also providing complementary classes to the Schools, Colleges and NGOs performing its role of nation building through skill development. Beside First Aid trainings, the institute offers training courses on specialized subjects such as Disaster Management, assessment and evaluation, vulnerability and capacity assessment, health in emergencies, Psychological Support Program, Leadership development of Youth, Casualty handling, Media and Communication and CBHFA. We have also constructed more than 100 toilets in different villages of Sindh with the Basic Awareness of Sanitation Classes to the poor people of villages. The Red Crescent Society has a facility of Mobile Medical Camps and Clinics. Regular Series of Free Medical Camps are being done in different villages time to time. These include Basic Lap Test, OPD and Referral System as well. The terrorist attack on Army Public School in Peshawar in Dec. 2014, and subsequent number of bomb blasts on education institutions have shaken the entire country and raised serious concerns about safety & security of the children in schools. Realizing the importance of the situation, the PRC Sindh designed an especial project named as “School Safety Program” under the DRR Component of our DM Program. This Program is aimed to improve the skills of the Children and staff for identifying threats / risk and its response in terms of natural & man-made disasters. We presented this case to the Govt. Authorities and series of meetings were held on this agenda with Commissioner Karachi and the education department of Sindh. The then Commissioner of Karachi issued few Notifications to all schools and Deputy Commissioners of Karachi to obtain this skills from the Red Crescent. On March 25th 2016 the formal inauguration ceremony was held in the Governor house where almost 70% concerned government officials attended the program. Minister of Education, Secretary Education, DG Rangers, Commissioner Karachi, Deputy Commissioners of the Districts, Director / DIG Counter Terrorism department, office bearers of Private school associations, Principals of Many schools, academia of universities and Colleges, member schools, Media and NGOs. Pakistan Red Crescent Society intends to extend its presence in all districts of Sindh however we have recently managed to construct three new buildings in Districts in the District of Jacobabad, Thatta and Badin not only their offices but also a warehouse, training units and few shops for their income support. Since the Pakistan Red Crescent Society has been formed under the act of parliament 1974 therefore it has a strong legal base. However with regard to its recognition and to be able to perform its auxiliary role with the Government, these require more close coordination and acceptance by the Government at every level. We request that the Government should give the Society a permanent status in their system i.e. PDMA, DDMA, Education Department, Health Department and Relief Department etc. In compliance to the act of parliament 1974 the PRC has its own constitution at National Level and 5 sub-constitutions at provincial Levels to make it more adaptable in line with the cultural and geographical requirement. The National Headquarters of PRCS is in a process to make one unified constitution of the entire PRCS. The process is going on with the consultation of all the Provincial Branches. In order to utilize the human resource of the organization at its maximum level, the in-house training packages are available for the staff and volunteers for their skills development. The Society also send them to the International Trainings, Conferences & Workshops for their regular updating. Since the main job of Red Crescent is Disaster Management and Health therefore the Society cannot afford to have rapid turnover of the staff therefore keeping the consistency of the staff and volunteers is the most important factor in the Society. The technical staff and volunteers of the Society are an asset of the organization. As per mandate of the Society we need to extend our Humanitarian Services to all corners of Pakistan, therefore the resource development is one of the biggest challenge of the Society as a whole. In Sindh Branch we have been successfully extending our presence in many districts and at the same time converting the weaker districts in to a strong district. We have constructed an office building and warehouse in District Branch Jacobabad, Thatta and Badin, which cost more than Rs. 30 millions. Being a charitable organization, this Society cannot earn the money from its outlets / facilities on a commercial basis. Our services are being operated on a nominal charges and mostly free for the poor people, therefore it is difficult to maintain its funding for the needy people. The Government does not give us annual grant, therefore no regular funding is available to run this noble work. Fund Raising has become has very important component of our projects as the donor does not normally give the salaries or administrative cost of the projects. We are exploring the possibilities of going joint venture with the corporate sector in Basic Health like Mother & Child Care, School Safety Program and Provision of Solar and Water Pumps in the desert areas of Thar. It is almost difficult to maintain the funding line up from minus. We therefore request our President /Governor of Sindh to help us in this regard. The Pakistan Red Crescent Society is strong enough in developing its clear guide lines and policies for many humanitarian works. Following documents are available in printed form for the guidance of the Staff and Volunteers. These Policies are in line with the regional and Global Policies and Guide Lines of the International Red Cross / Red Crescent Movement.